Just What Is a 'Wise Latina,' Anyway? Washington politics may not be good at producing health-care reform, but it's great at creating catchy new lingo. Getting "Borked." "Hanging chads." "Lipsticks on pit bulls." The latest is "wise Latina," two words that have been repeated ad nauseam since the middle of May, when conservatives started flogging the text of a 2001 speech given by Supreme Court nominee Sonia Sotomayor at the University of California, Berkeley. 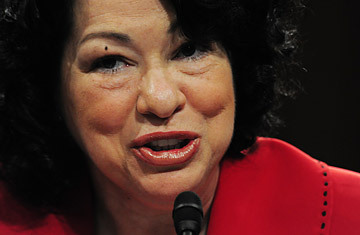 In that talk  on the subject of a Latino presence in the American judiciary  Sotomayor now famously said, "I would hope that a wise Latina woman with the richness of her experiences would more often than not reach a better conclusion than a white male who hasn't lived that life." In May, after the blog Verum Serum and then the New York Times posted the text of the speech online, a vaudevillian assortment of right-wing politicians and commentators have taken this remark as evidence that Sotomayor is a racist who will pursue an unknown agenda once ensconced in that great neoclassical retirement home known as the U.S. Supreme Court. Rush Limbaugh  cue falling sky  declared it the dawn of Macaca-gate II. To be sure, the idea of a "wise Latina" is a new one to a lot of people. Before the Sotomayor speech was made available, finding the words wise Latina in articles of any sort was exceedingly rare. Latinas are frequently described as "fiery" or "caliente" or "curvy"  but rarely "wise." A cursory Nexis search reveals only a single book review, from 2000, of a sci-fi tome called The Fresco, in which a heroine who communes with aliens is described as the daughter of "a wise Latina lady and her salvage-yard husband." Clearly a page turner. Wise Latinas may have gotten little air time in U.S. pop culture, but the archetype is an old one among Hispanics: the wizened old woman who serves as a storehouse of folk wisdom  and is occasionally blessed with healing powers. It is the character of solid-like-a-rock Big Mama in Gabriel García Márquez's short story Big Mama's Funerals. It is otherworldly Ultima in Rudolfo Anaya's Chicano lit classic Bless Me, Ultima. And on the telenovelas, it is the kindly older lady who knows who the father of the orphaned deaf-mute child is but doesn't say out of propriety. At the July 14 hearing, the nominee explained that "wise Latina" was her attempt to play off a quote by retired justice Sandra Day O'Connor, who said that "both men and women were equally capable of being wise and fair judges." Sotomayor said that "my play fell flat. It was bad." But Sotomayor is just trying to ameliorate her critics without having to make them look... unwise. She has nothing to apologize for  and neither have other politicians and judicial nominees who have said the same thing in their own words. To get at what Sotomayor meant, we can look to that pop-cultural repository of Latino wisdom, Edward James Olmos. In the 1997 biopic Selena, there is an eye-rolling Latino Studies 101 moment in which Olmos, playing Selena's dad, talks about how difficult it is to ride the divide between Latino and American in the United States. "We gotta know about John Wayne and Pedro Infante," he huffs. "We gotta know about Frank Sinatra and Agustin Lara. We gotta know about Oprah and Cristina." Update: We gotta know about the Jonas Brothers and RBD. In other words, we gotta be wise to the ways of more than one culture. And that's all Sotomayor was trying say: that her breadth of experience navigating different worlds might lead her to have greater wisdom on certain topics than her white male counterparts. It is no different from what Samuel Alito said in 2006 ("when I get a case about discrimination, I have to think about people in my own family who suffered discrimination because of their ethnic background or because of religion or because of gender"). And what countless other Congressmen and Supreme Court nominees and presidential candidates have said when channeling their own "I grew up in a van down by the river" youths. Our varied experiences shape us, they enrich us, they give us the ability to... empathize. Our government in Washington has provided political employment to pest exterminators, grade-B actors and Alabama Senators who think of the 1965 Voting Rights Act as a "piece of intrusive legislation." (I'm talkin' to you, Jeff Sessions.) And I, for one  a Latina who has spent her whole life watching her ethnicity and gender reduced to a pile of red lipstick and high heels  am ready to see a wise Latina in that mix. Miranda, a former reporter for TIME, is an arts and culture writer based in New York. She blogs at C-Monster.net.